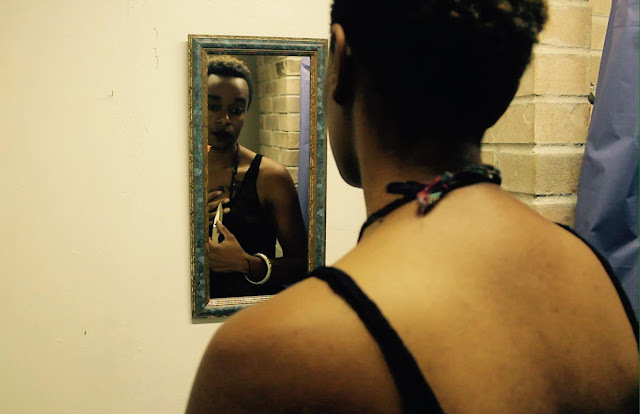 A young Black woman immersed in the punk/alternative scene turns to sinister behavior as the breaking point of her experiences with discrimination and invisibility come to an inevitable boil. 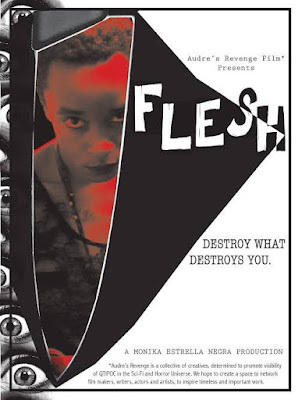 If there ever was a way to imagine what a Black woman-centric version of Maniac (1980) would look like, Monika Estrella Negra's direct approach with her inaugural project Flesh certainly sets the blueprint. Its poetic, experimental tone cuts emphatically at the jugular of social anxieties, the frustration, and the anger that (queer) women of color face. Specifically Rae's presence (played with effective menace by Ester Matthews Alegria) in her alt-social/creative environments and the hierarchy of whiteness, to the hypocrisy of its anti-establishment veneer, is still ever present and overshadowing with a distinct, alluring nuance. As we see Rae constantly searching for something within the world she's in, we see her already shaky foundation begin to crumble. The unsettling power dynamic that bubbles just beneath the surface as Rae's friend (Hannah Hearts) flaunts her ignorance with exuberance at Rae's expense. She'll never understand the insecurities that come with being a Black woman dating, existing, and all the crushing negativity inflicted on Black women that render them undesirable. Coupled is the harder feats for self-acceptance and how much longer of a road that can be for women of color, Rae here in particular, still in the wildness of looking for acceptance from others. That search for 'something,' even with my assessments here, you have to decide. That 'something' is the strength of Flesh as a discursive narrative. Because of the deeply imperative exploration such critical, social concerns, Flesh's main crime is that you wanted more time with Rae and her prism into the world, akin to Dexter. This complicated character is striking and bare. Alegria holds a vulnerability throughout her performance that grows legs of contention. All at once softly terrifying, lost, and essentially relatable, killing becomes a message for killing systems that ultimately kill us. Because of length and themes, certain technical choices may appear too abstract for enjoyment, but I would contend that Flesh takes that gamble to challenge viewers. Flesh never loses steam, ending on a reflective and mournful note. Imagine February and Darling along with the previously mentioned properties birthed from a concoction that only the energy of Bassett's portrayal of Marie Laveau could conjure from the sweat of a mosh pit and you receive Flesh as a promising next step in horror film's evolution of inclusive storytelling.